IBM® SmartCloud® Virtual Storage Center provides efficient virtualization and management of heterogeneous storage systems. It facilitates migration to an agile cloud architecture that can optimize storage availability and performance, while helping to reduce costs. 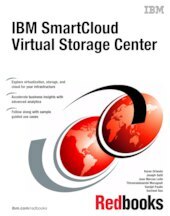 IBM SmartCloud Virtual Storage Center (VSC) helps convert existing storage to IBM Smarter Storage, providing more room for data growth and simplified storage administration. This IBM Redbooks® publication gives an overview of the concepts of software-defined environment (SDE) and software-defined storage (SDS), and how they work together with VSC. It explores the architecture, components, and interfaces, providing details of VSC and how to use it. This book is primarily for storage administrators, users who are responsible for maintaining IT and business infrastructures, and anyone who wants to learn more about IBM SmartCloud Virtual Storage Center.